Operation Redwood | Shelf Elf: read, write, rave. 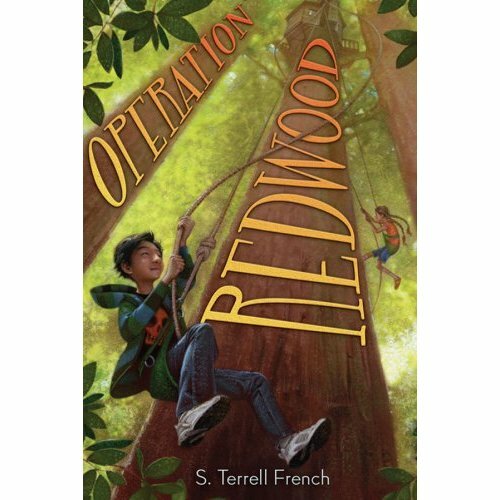 S. Terrell French’s debut Middle Grade novel, Operation Redwood, is an eco-adventure story that delighted me from start to finish. French combines spunky characters, authentic kid friendships and environmental activism to create a story that is exciting, heart-warming and inspiring. Julian Carter-Li is living with his high-powered uncle while his photographer mom travels the globe. He doesn’t like this arrangement much, because his aunt and uncle are pretty unpleasant and make it obvious that they don’t really want Julian around. When Julian happens to read a very angry email sent to his Uncle Sibley from a girl who accuses Sibley of planning to destroy a stand of redwoods, he ends up getting pulled into a fight to save the forest. Along the way, Julian learns a lot about the magic of the redwoods, life in the country, friendship and family ties. I always admire a writer who can create an MG novel that will surely appeal to both boys and girls. S. Terrell French has achieved this in Operation Redwood, as the novel offers well-drawn male and female characters and the adventure element whips along with plenty of risk and duplicity and kid-ingenuity, sure to attract all readers. MG novels with convincing characters and a non-stop story don’t happen everyday. More often it seems that you end up with more of one than the other. Not so here. I guess that’s what produces the feeling you’ve got by the end of Operation Redwood that you’ve read something substantial and lasting, and certainly a book you want to pass on to every kid you know. I loved this story’s freshness, it felt especially “now” with its environmental emphasis, and I think there is something in the confident, savvy nature of the kids that young readers will recognize. Naturally, the story is packed with potential links for educators, and I imagine that it would make a smashing read aloud in the classroom. Kids need more books that demonstrate how they have the power to change the natural world for the better. For wannabe activists, tree-huggers, and all middle grade readers, Operation Redwood comes very highly recommended. Operation Redwood is published by Amulet, an imprint of Harry N. Abrams. This entry was posted in Class of 2k9, Middle Grade, Openmind on April 21, 2009 by shelfelf. This book sounds great! I love the Redwoods. One of my favorite biographies is by Julia Butterfly Hill-the young woman who lived in a tree! I agree this was a great read! My kids loved this one, the boy and the girls. I like a story that’s got an empowering message. I’m going to recommend it to every 5th grade teacher I know. It fits perfectly with the science curriculum that year. Great review – I cannot wait to get my hands on it!